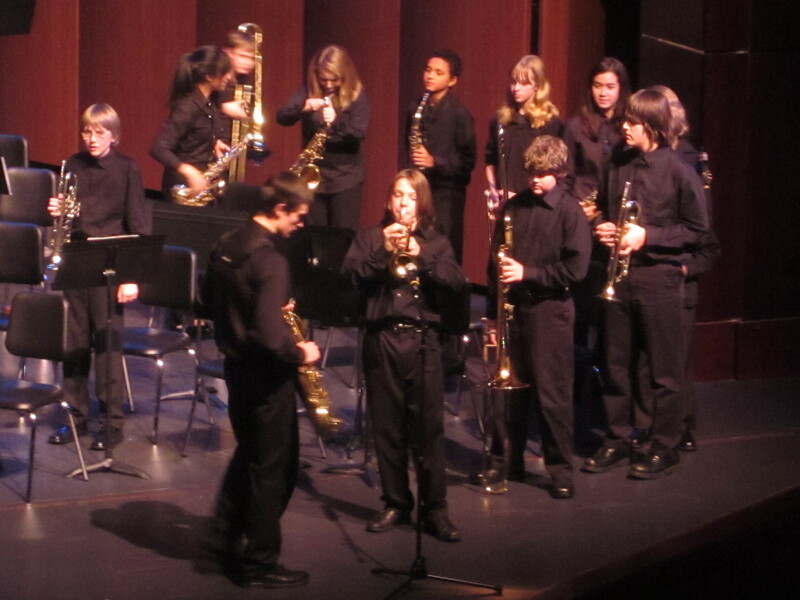 Mr. Shawn McGinn, director of bands and orchestra at Skyview Jr. High in Bothell, wore a tuxedo with cummerbund, and the students were all dressed in solid black. That tells you how classy this concert was! 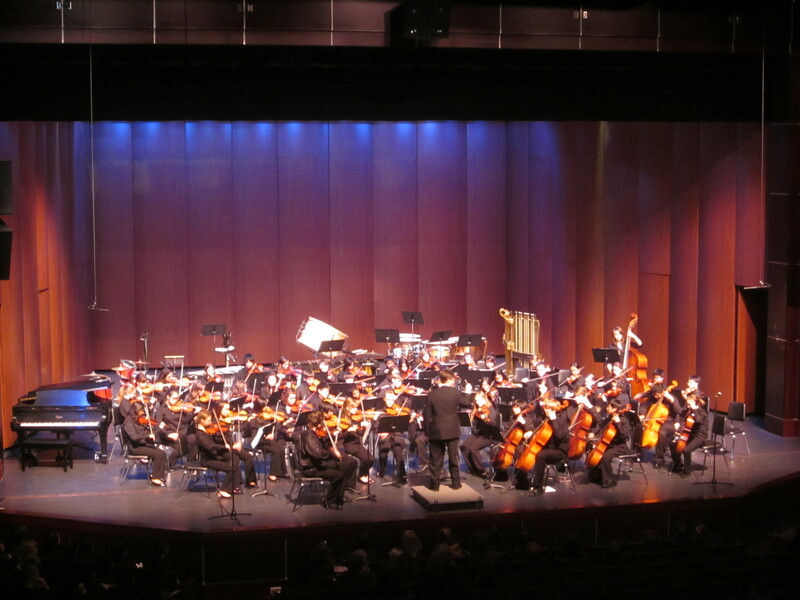 It was held last Thursday in the 600-seat Northshore Performing Arts Center (NPAC), and the house was packed. 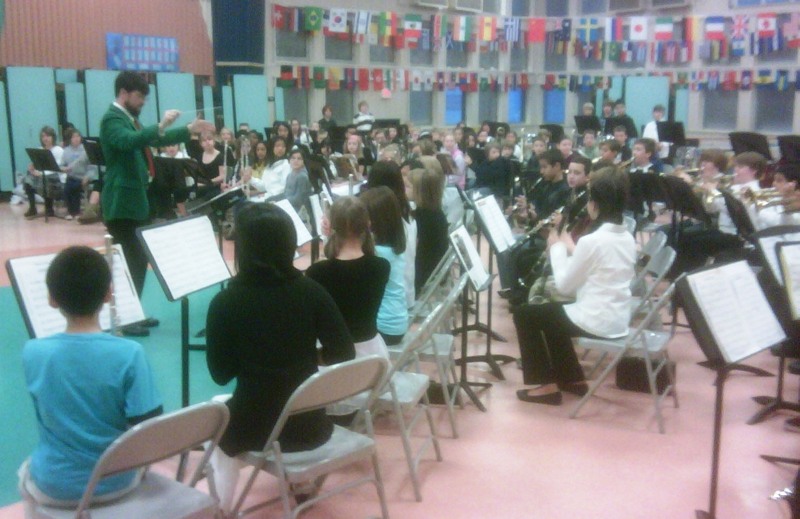 Like all of Mr. McGinn’s school concerts, this one was well-organized and well-rehearsed. 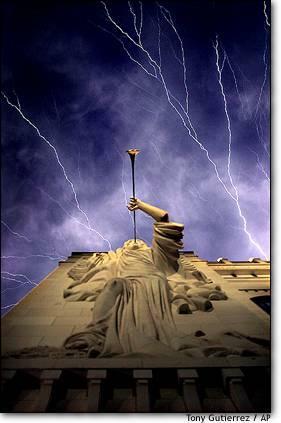 The students knew what was coming and what to do when the time came…and they did it well! It was a very entertaining and impressive evening event. 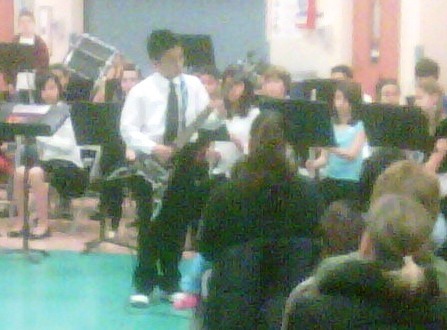 More than anything, I am impressed with the breath and depth of the music program he is building. It has to be one of the best within the Northshore School District, and it’s getting bigger and better all the time. 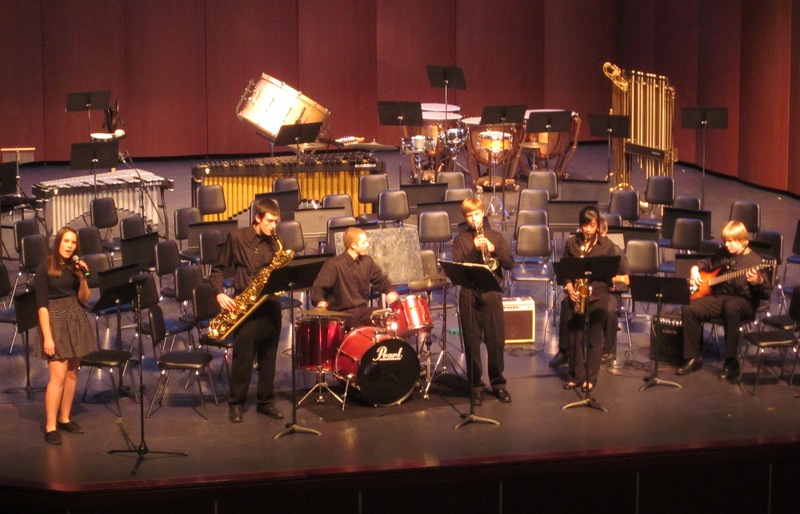 At this concert, the opening act was a self-directed jazz sextet with vocalist, and that was followed by the orchestra, conducted by Mr. McGinn. 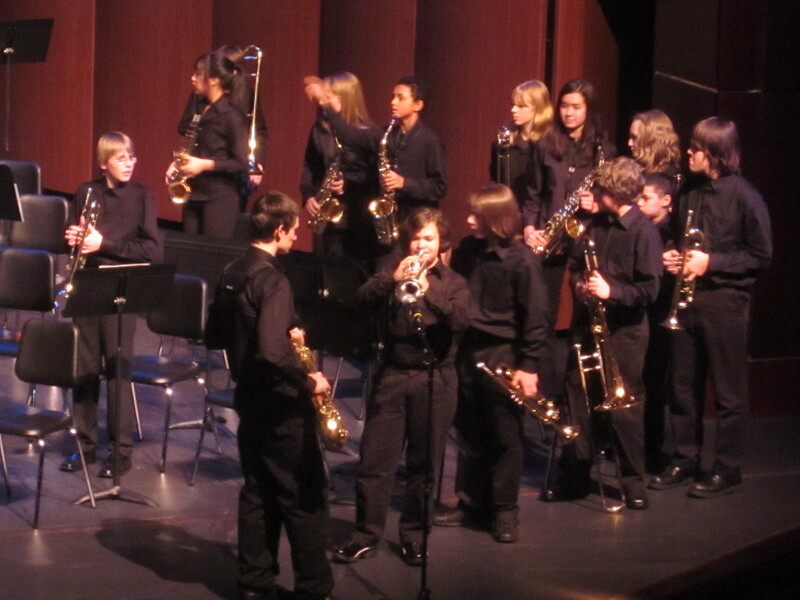 Next he led the 7th grade band, after which he conducted the 8th-9th grade band and the jazz band. these groups practice. And remember, Mr. McGinn has been doing this for several years! That really pulls and stretches a teacher. Does this man have passion and drive? Does he have purpose? As an audience member, it’s a pleasure to witness all these people on stage, striving with their leader for excellence. And just think: this is happening all over America and in some form or another, all over the world. Music is a giant. It pervades every culture. 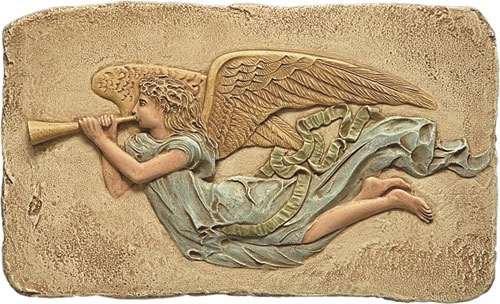 How did this come to be?—because the gifts of natural musical talent and ability are not rare. Yes, great talent is indeed quite rare, but many, many people worldwide are born with excellent musical talent and then develop outstanding abilities. It is quite common among us. Why? Is there some noble, universal purpose to this? For me, the answer is clearly yes—so we can express ourselves, so we can communicate with each other in infinite ways by infinite means, so we, too, can create beauty, so we can give and share among our communities. 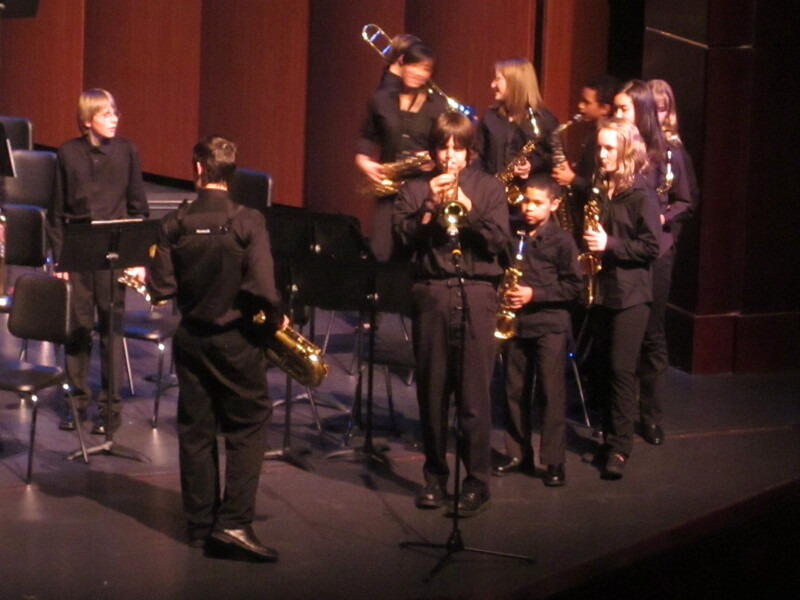 When we play our instruments and sing for others, even in the school cafeteria or NPAC or Husky Stadium, we are on the world stage. Hear Ye, Hear Ye, Hear the Words of Aldous Huxley: After silence that which comes nearest to expressing the inexpressible is music. 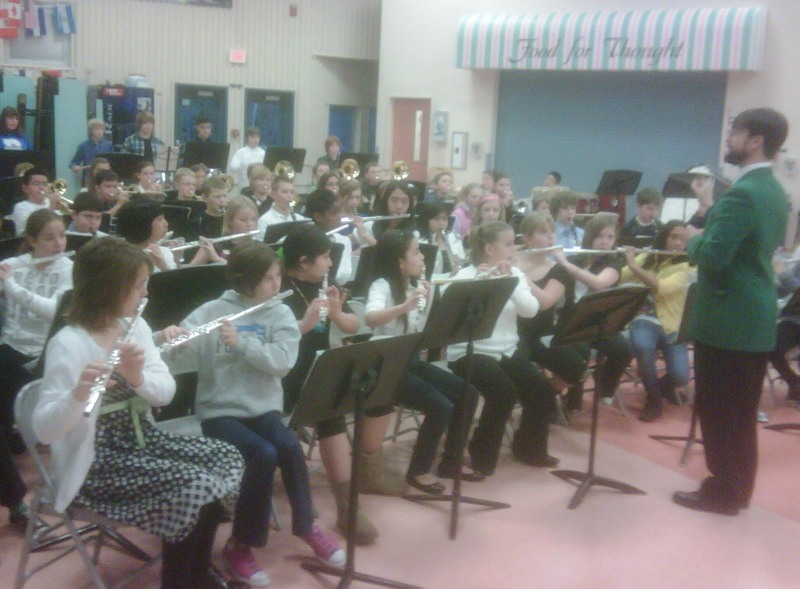 Early last Wednesday, about 150 parents and relatives swarmed into the cafeteria at Skyview Jr. High (SJH) in Bothell, WA, to see and hear their kids play in the winter concert by the two elementary bands conducted by Mr. Shawn McGinn. 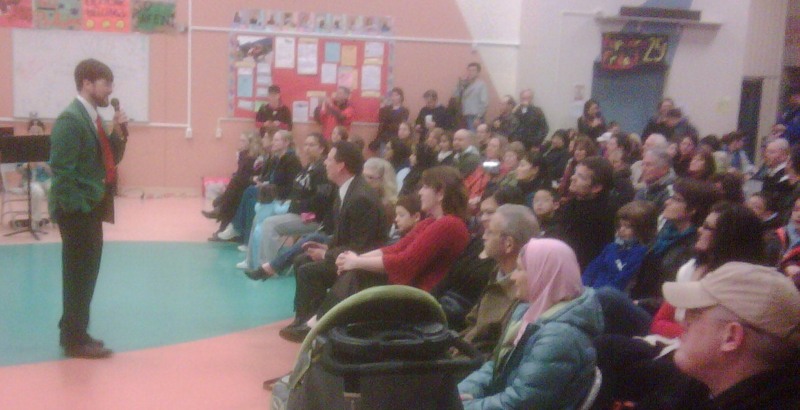 It was a standing room only crowd! 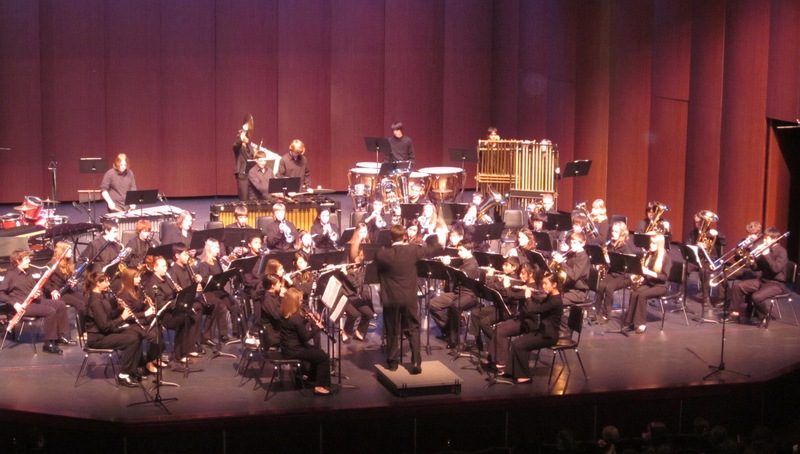 The 1st-year and 2nd-year bands are comprised of about 85 students in the 5th and 6th grades from three elementary schools which feed into SJH: Crystal Springs, Canyon Park, and Fernwood. 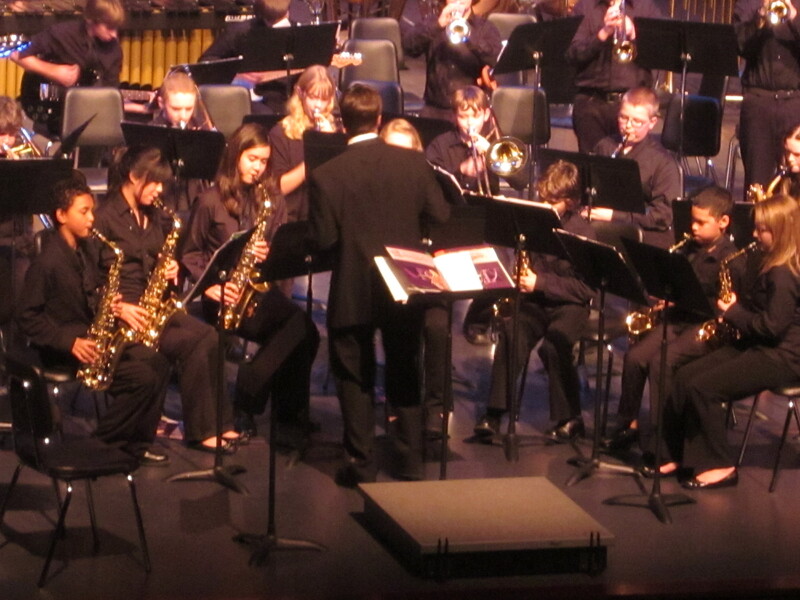 As you know, I’m Mr. McGinn’s assistant for brass instruction with both these bands (see my post on 6 September 2010). 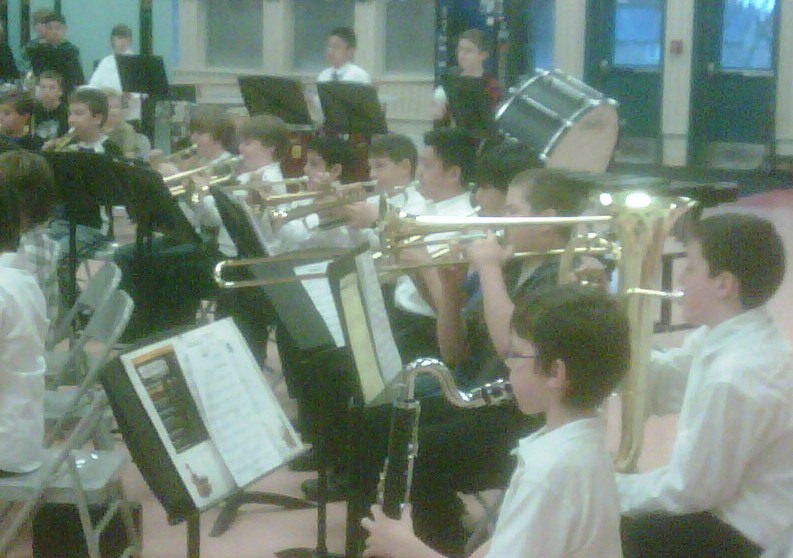 First, the 1st-year band played “Jingle Bells,” followed by “Mr. Dreydl,” featuring the flutes. 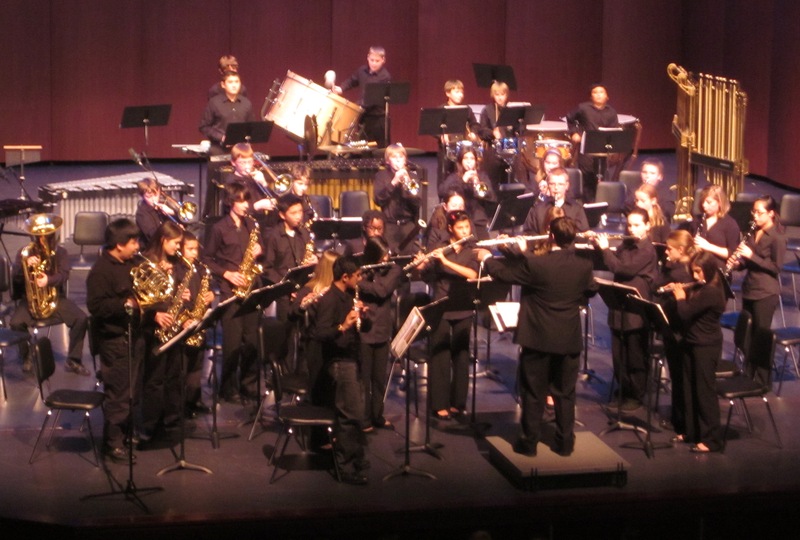 The clarinet section then played “Ode to Joy,” and the brass section (4 trombones and 22 trumpets) played a duet, “London Bridge is Falling Down.” Finally, the percussion section laid down a rock beat. The whole concert was very impressive. 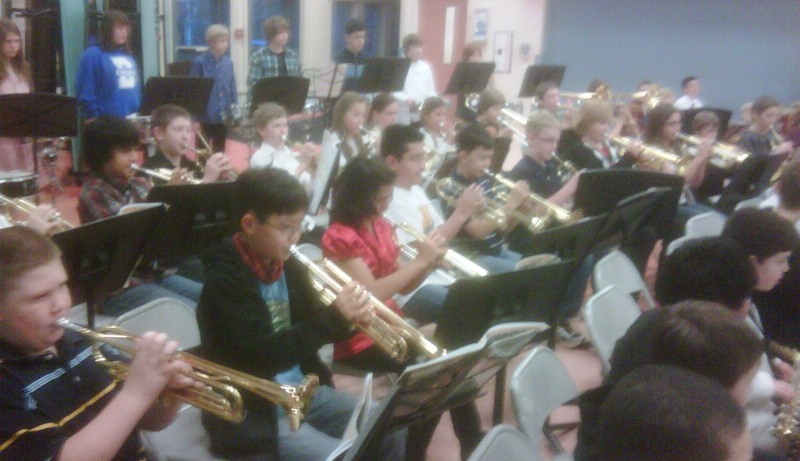 The kids were well-rehearsed, well-behaved, and played very well. They’re learning their horns. Everyone is proud to be in these bands! How do they do that? 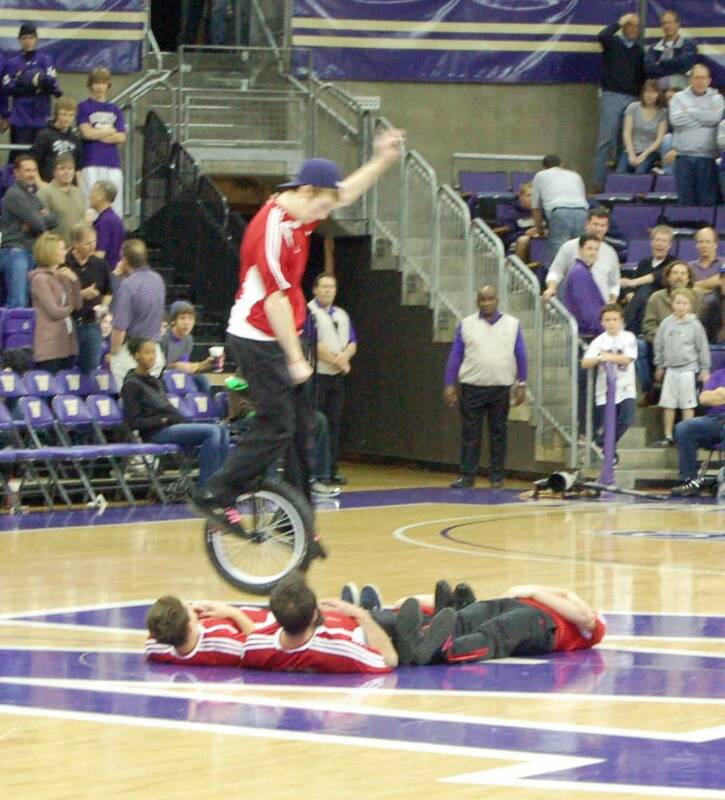 That’s what I always wonder when I see people riding unicycles and doing their amazing moves and tricks. 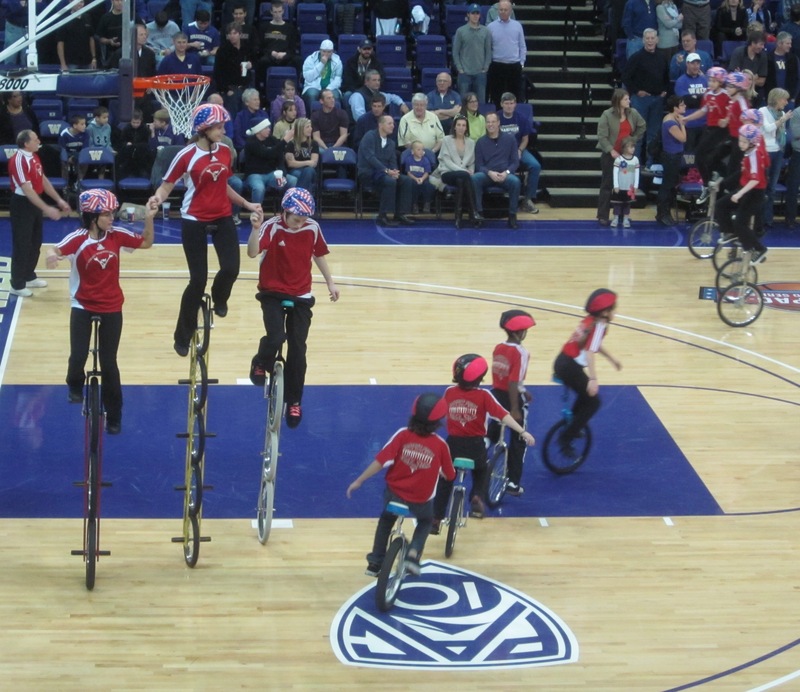 And that’s what made the half-time show so thrilling at the basketball game in Seattle between the University of Washington Huskies and the Texas Tech Red Raiders on Dec. 4. 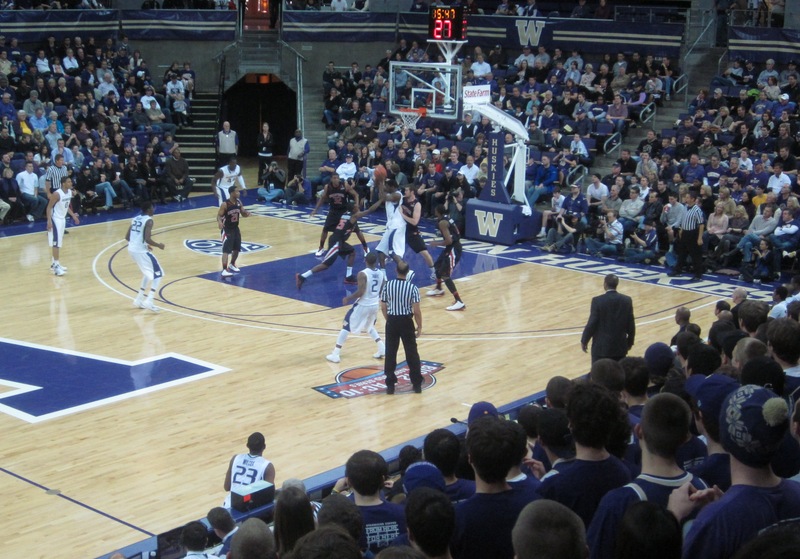 [I played trumpet in the Husky Alumni Pep Band at this game.] 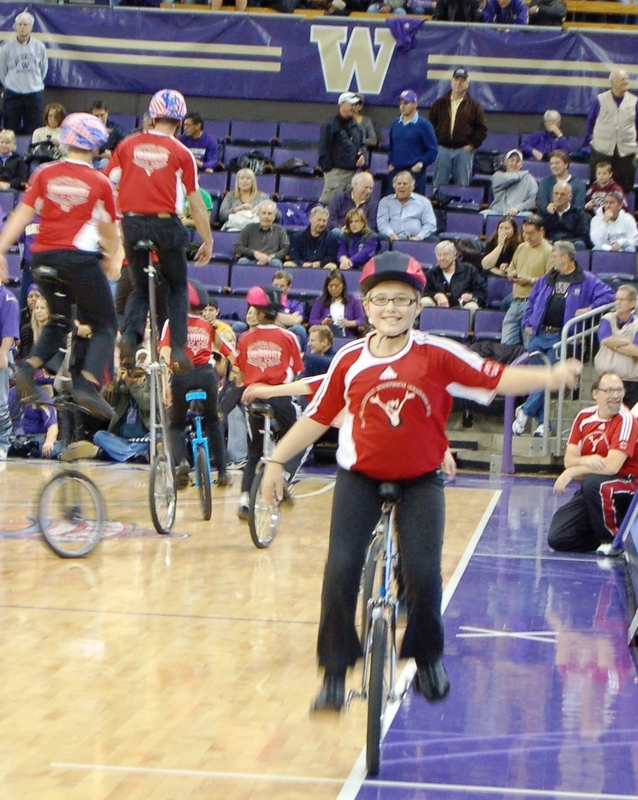 The half-time buzzer sounded, the two teams trotted off to the locker rooms, and out onto the court rolled about 40 dazzling members of the famous Panther Pride Unicycle Team (PPUT) from North Bend, WA in the Snoqualmie Valley. The riders range from age 7 and up. How do they even get up on those things, much less keep from falling off? 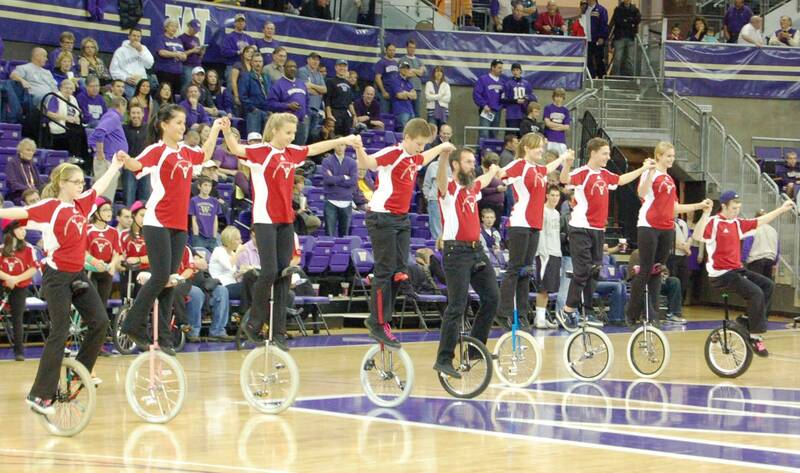 Well, as I learned from their website, www.pput.info, there are at least 11 different ways to mount a unicycle. 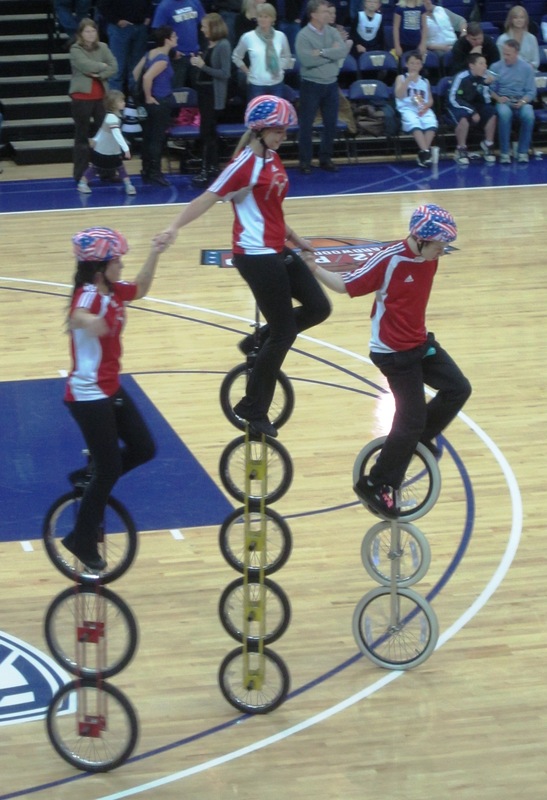 And the Unicycling Society of America has defined 10 skill levels of unicycle riding (see http://www.unicyclingusa.org). Last July, PPUT competed at the “U Games” in the San Francisco Bay Area (see http://ugames.caluni.org). 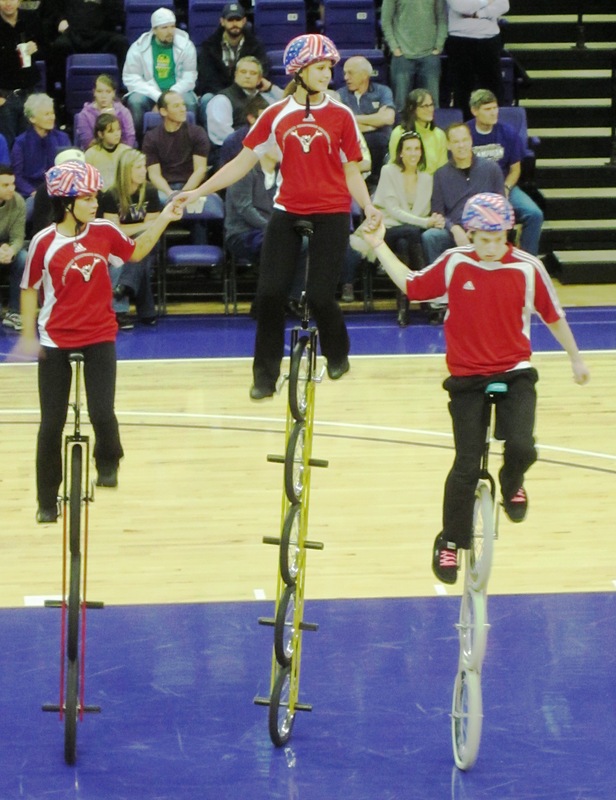 These games are the North American Unicycling Championships and are the largest gathering of unicycle enthusiasts on the continent. PPUT brought back 60 gold, silver and bronze medals! 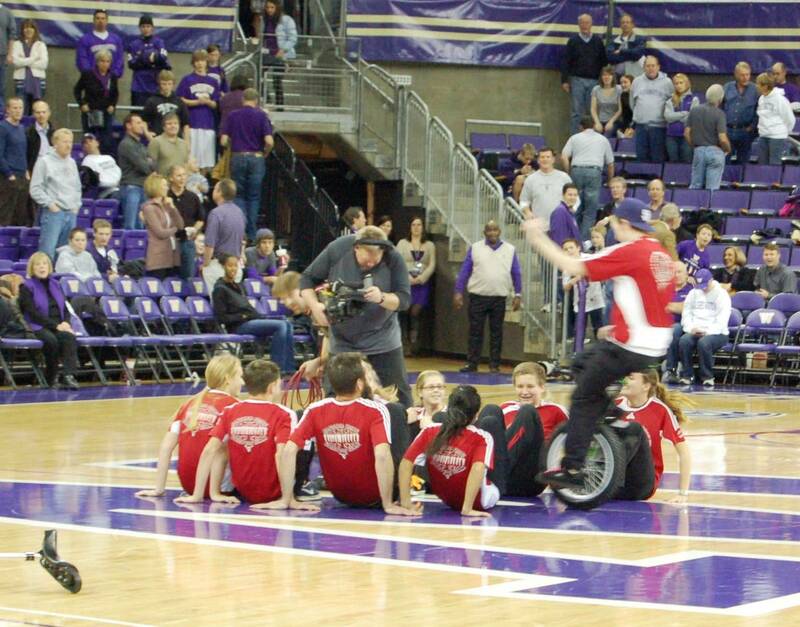 They appear on TV (see http://www.king5.com/new-day-northwest/Panther-Pride-Unicycle-Team-99467054.html). They ride in various parades, including Macy’s Holiday Parade, Salmon Days in Issaquah, and Autumn Leaves Festival in Leavenworth. 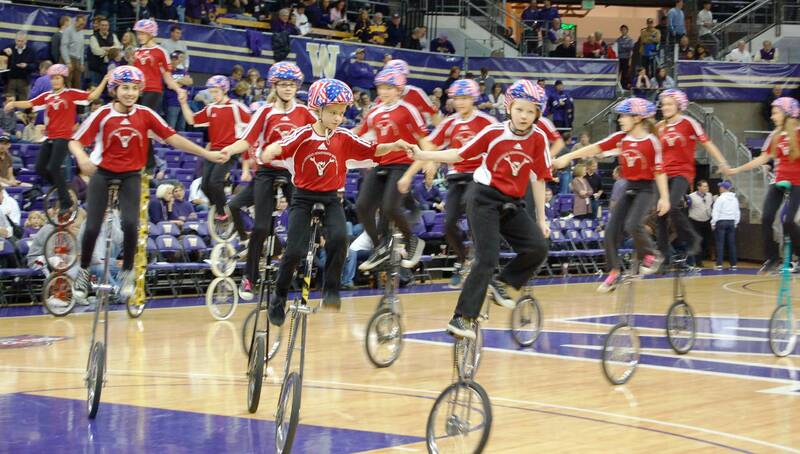 They do shows at basketball games for UW, Seattle Pacific University, Seattle University and others. They perform for corporate and group special events, local and statewide, and have tons of Flickr photos and YouTube videos (see http://abclocal.go.com/kgo/story?section=news/local /san_francisco&id=7561416&rss=rss-kgo-article-7561416). 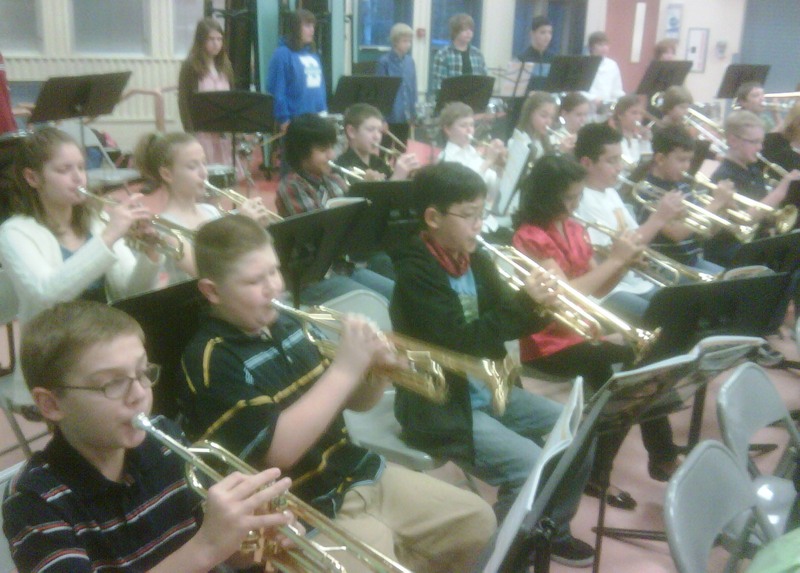 See what happens when you play trumpet in the school or alumni band? You get to see marvelous shows like this–free! 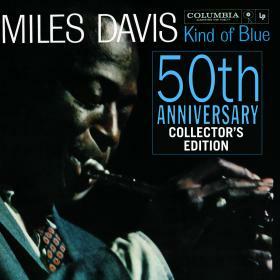 It broadens the mind and uplifts the spirit, that’s what it does. I’m always amazed at how many people are engaged in so many volunteer activities like this, whatever they may be—from flying model airplanes to rock climbing to drum and bugle corps to Renaissance festivals and medieval fairs to dog shows and horse shows, et.al.—“you-name-it.” And very often these activities evolve into organized competitions from the local to national to world levels. Whatever the endeavor, we all appreciate, admire and honor excellence. The next time you’re in the library, find a directory of societies and associations—-it’s thick!—and open its pages. You’ll be amazed at the variety of human interests and avocations. And we’re just like everyone else—it’s fun to play trumpet and ride unicycles for free at basketball games! 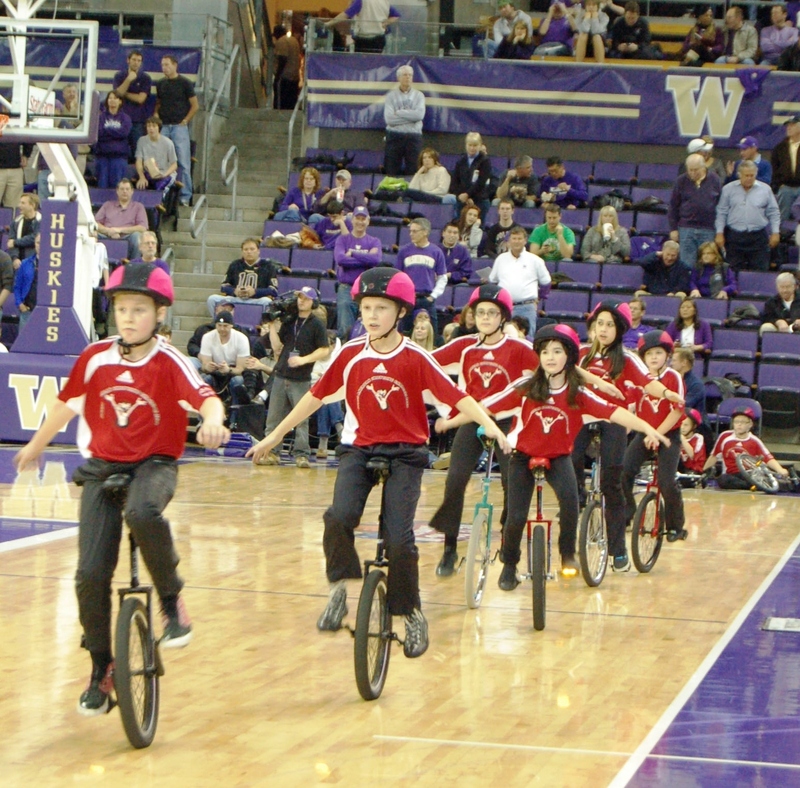 While the UW Varsity Marching Band was away in Pullman for the Apple Cup football game—by the way, UW beat WSU, 35-28!—the Husky Alumni Band supplied the pep band for the home basketball game in Seattle against the Texas Tech Red Raiders from Lubbock, TX. 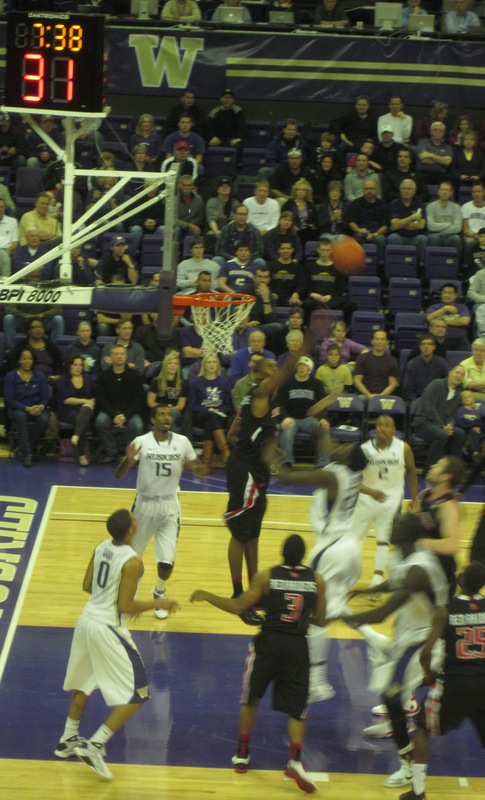 It was no contest, as the Huskies won “going away” in dominating fashion, 108-79. What was the prime difference between the two basketball teams? the players? the coaches? the home court? the talent? the height, size, length? the quickness, speed, leaping ability? the offense, the defense? the bench depth? the experience level? Or was it something else, perhaps–some hidden ingredient? Maybe the secret advantage was the inspiration provided to the team and the crowd by that outstanding pep band, led by those 8 great trumpet players (including me)! Well, why not? why not make the claim? why not take the credit when something everybody wants to happen turns out just right? Our politicians do that every day! 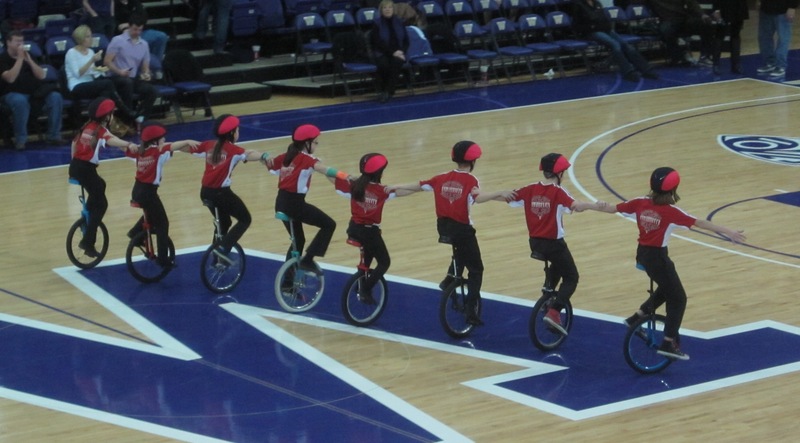 And let’s give some extra credit to the fabulous half-time show, too, featuring the Panther Pride Unicyle Team from Snoqualmie Valley (see the next post on this blog). They must have helped the fans and Huskies some, too, huh? 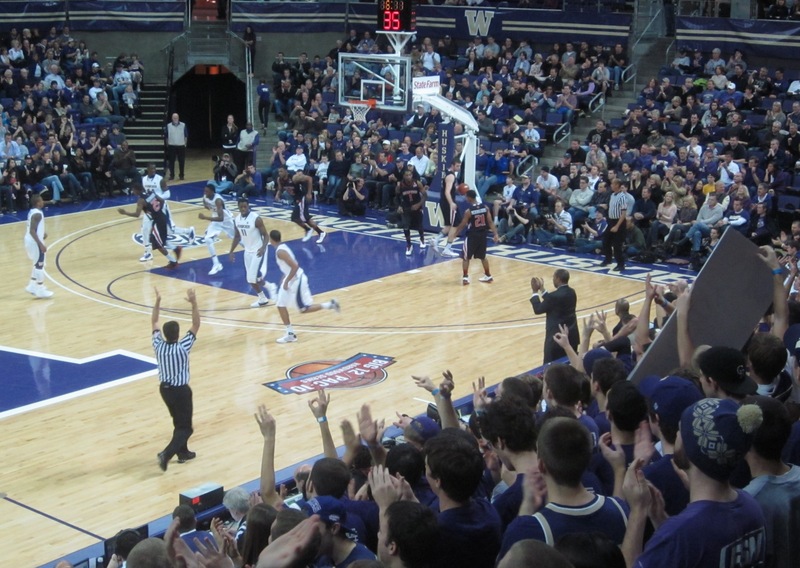 Now if you want a better description of how the game was actually played, please go to http://www.gohuskies.com/sports/m-baskbl/recaps/120410aaa.html and watch the highlights on http://www.youtube.com/watch?v=BDUwJMwtEFM&feature=player_embedded. 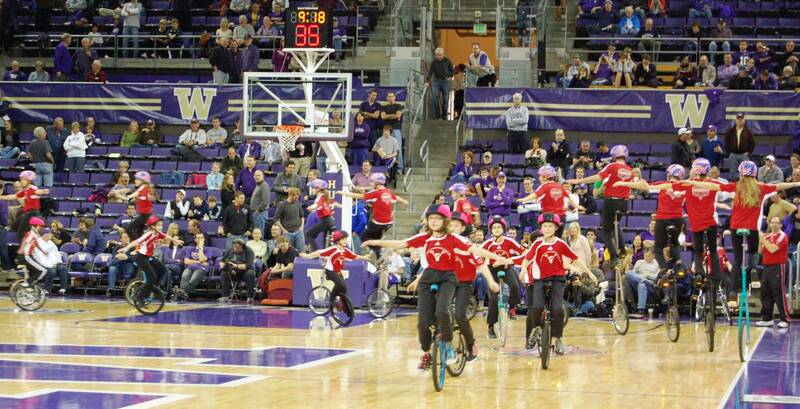 Man, does this Husky team look tough! 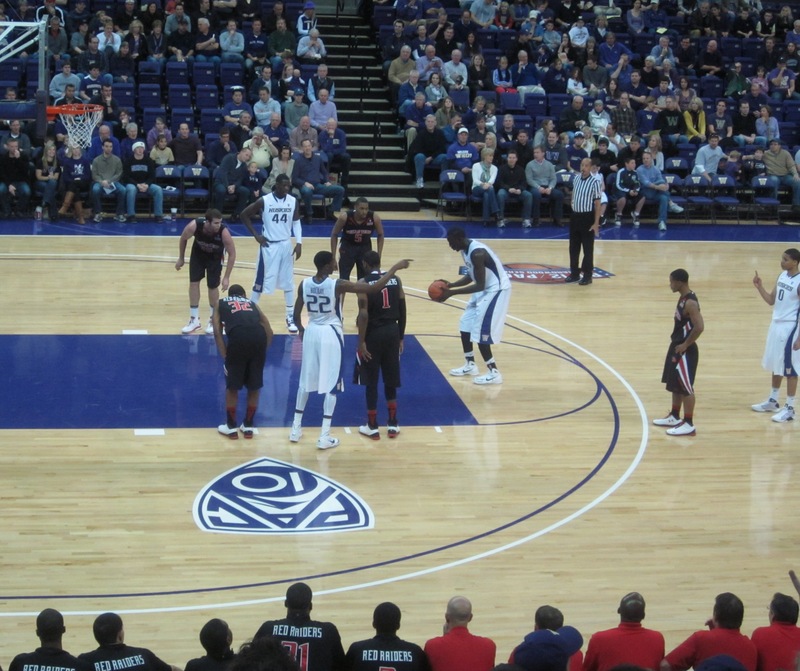 I think it’s the best team Coach Lorenzo Romar has ever assembled. We’ll see. 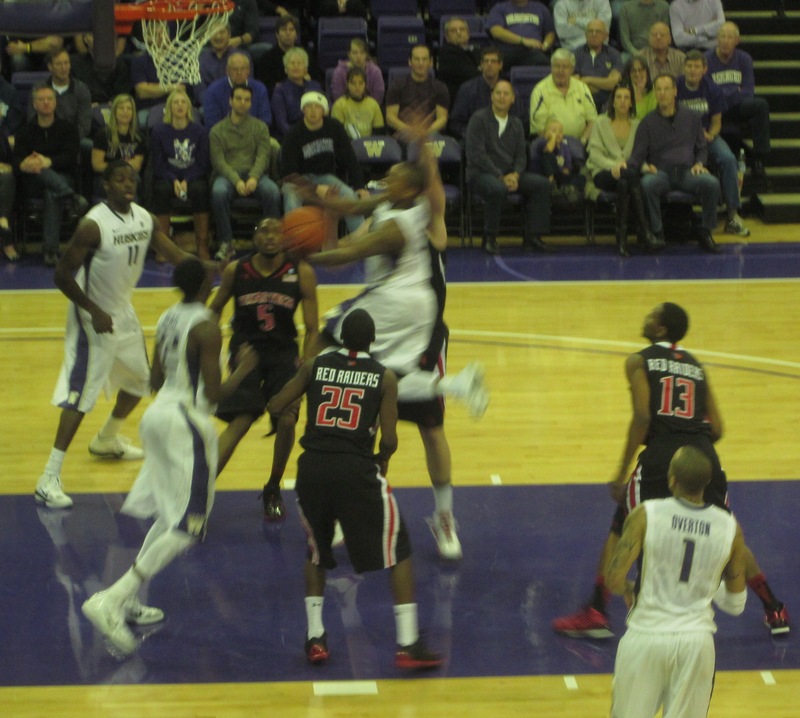 You remember last March, when the Huskies lost to West Virginia, 69-56, in the first round of the Sweet Sixteen in the NCAA Basketball Tournament? That game was “the men against the boys.” Their starters were taller, heavier, stronger, and just as quick and fast. We were no match. N’Diaye), and a sterling Justin Holiday. Coach Lorenzo Romar says he has a 10-man rotation right now and is hard-pressed to narrow it to 8. 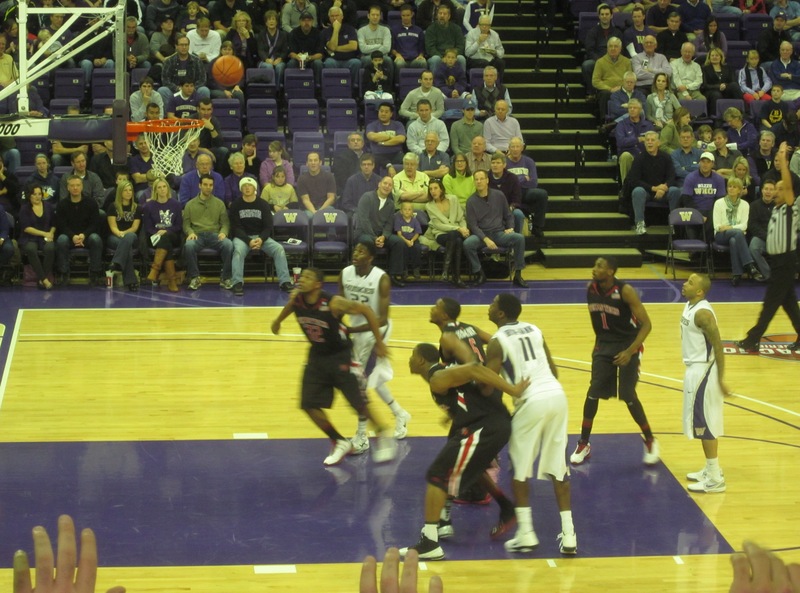 Plus, Romar’s teams always seem to improve throughout the season. For example, N’Diaye is foul-prone; he fouled out last Saturday. We need him to rebound, block shots, and defend well. Let’s watch him improve. 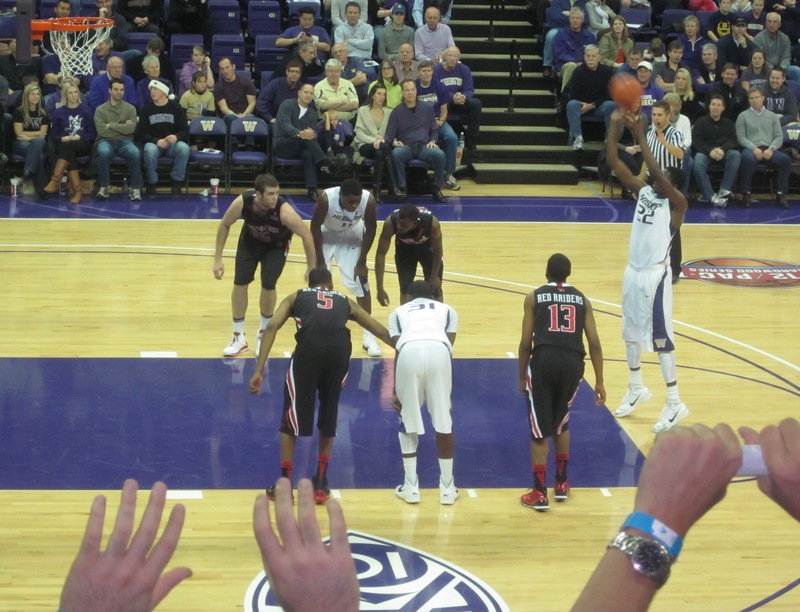 The Maui Tournament exposed our weaknesses, and we have about four months to work on them. If we peak at the right time—post-season tournament time—we could be double-trouble for anyone! 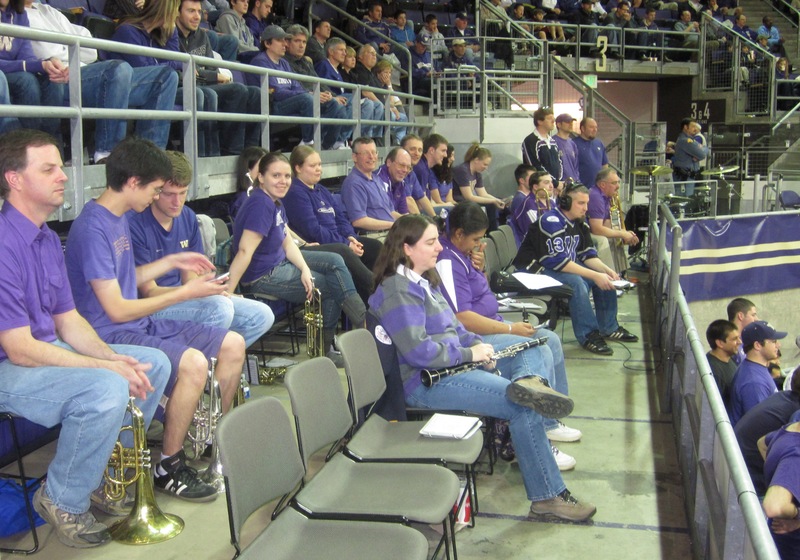 Next March, we want to at least break through the “Sweet Sixteen” into the “Elite Eight.” That’s what the Husky Alumni Pep Band is playing for. Come on, guys–let’s even aim to play in “The Big Dance!”—let’s be there, Reliant Stadium, Houston, TX, 2-4 April 2011. Book it! 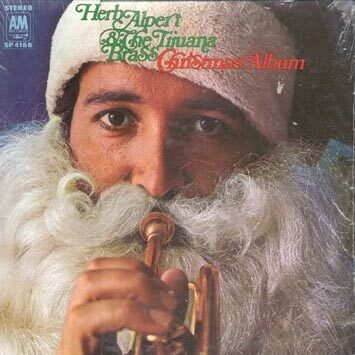 So you like the trumpet and you like Christmas, right? Then put ’em together and either (1) give a CD to someone for Christmas or (2) add a CD to your own Christmas-gift wish list so that someone can give it you. 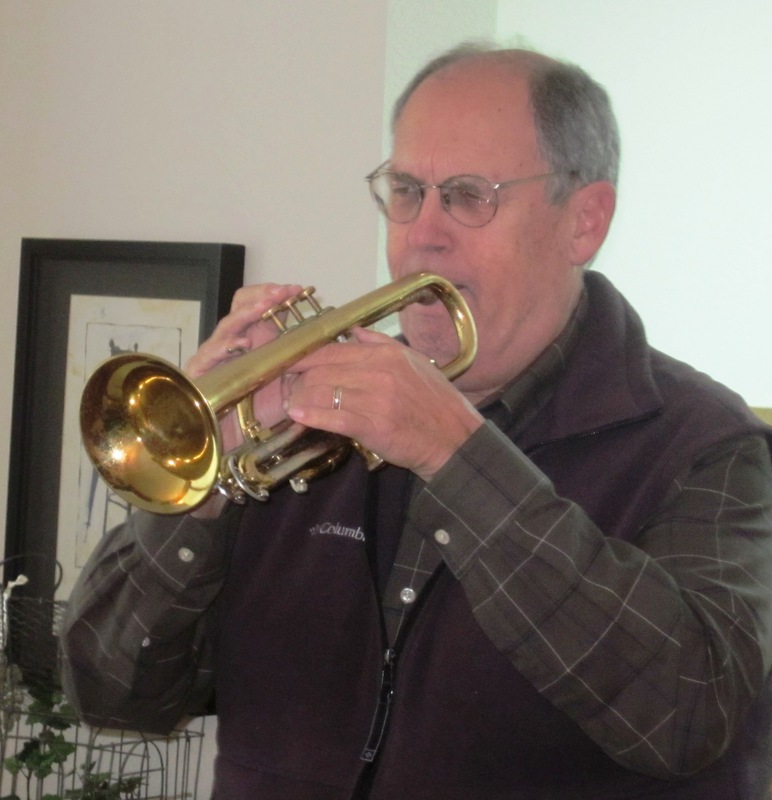 Not just a CD of beautiful Christmas music—make it a CD that features great trumpeters playing great Christmas music! If you have a favorite not listed here, please click on “Leave a Comment” below this post, give me the artist and title, and I’ll add it to the above list. 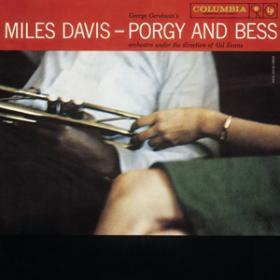 If you want to learn more about these favorites and even listen to excerpts from some of them, simply copy the bulleted item, paste it into a search engine box, and hit “search.” You’ll find lots of results that link you to websites featuring that item in some way. And I wish you and yours a Very Merry Christmas and Happy New Year, with God’s many blessings!